I made this padded laptop cover using Holly A Tana Lawn from Liberty’s Spring/Summer 2014 seasonal collection. If you are using fabric with a pattern that runs parallel to the selvedge (like the fabric I used), measure the height of your laptop and multiply it by 3 to calculate the length of fabric you will need. Assuming your laptop is less than 50cm wide, you should have enough fabric to cut out two pieces for your cover (make sure you add 5cm to the width measurement for the seams!). One of your pieces of fabric will be for the outside of the cover and the other will be for the inside. I decided to quilt my cover to keep the batting and fabric layers together. To do this, use a set square and tailor’s chalk to draw lines 2 inches apart at a 45 degree angle from the selvedge on the batting, in both directions. Once you’ve done this with both pieces of fabric and batting, put the two pieces together with the batting facing each other. Place your laptop on the fabric and fold the fabric up so one edge is just above the top of the laptop. Pin the sides and sew together. Then turn the cover inside out. Cut the velcro so it is nearly the entire width of the laptop cover, then sew the rough “hook” piece of velcro onto the main part of the cover. Sew the soft “loop” piece of the velcro on the “flap” part of the cover but only through one piece of the fabric/batting so that you don’t see the sewing line when the flap is closed. This entry was posted in Making our own, Sewing and tagged sewing. Over the holidays I decided to make a new ironing board cover to replace the grubby, threadbare thing we were currently using. For those of you feeling crafty, this is how to do it. Bamboo batting. 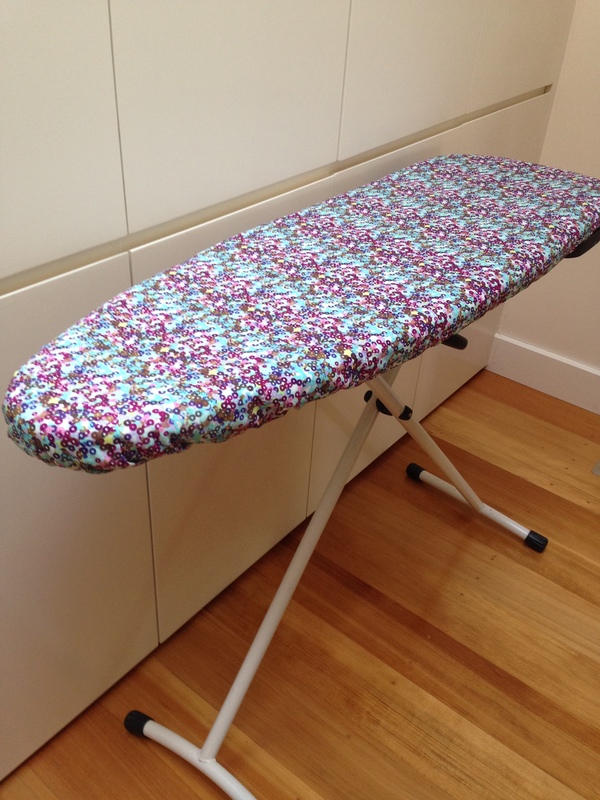 Work out how much you need by measuring your ironing board, then add 20cm to the height and 20cm to the width. You will need to buy double this amount as the bamboo batting is not very thick. I purchased some from Lincraft. Fabric. Add 30cm to the height and to the width of the measurement of your ironing board to calculate the amount of fabric you need. Consider buying ironing board fabric, or thick cotton. Elastic. I used 1 packet (2 metres) of 12mm wide elastic, but ultimately the amount you need will depend on the size of your ironing board. Notions. Cotton thread, a sewing machine, pins, scissors and a tape measure will all be useful! Lay the two layers of bamboo batting flat on the floor. Then lay your ironing board on the floor on top of it. Trace 10cm around the ironing board, then cut out the batting and put it aside. Lay the fabric flat on the floor. Lay your ironing board on the floor on top of it. Trace 15cm around the ironing board, then cut out the fabric. 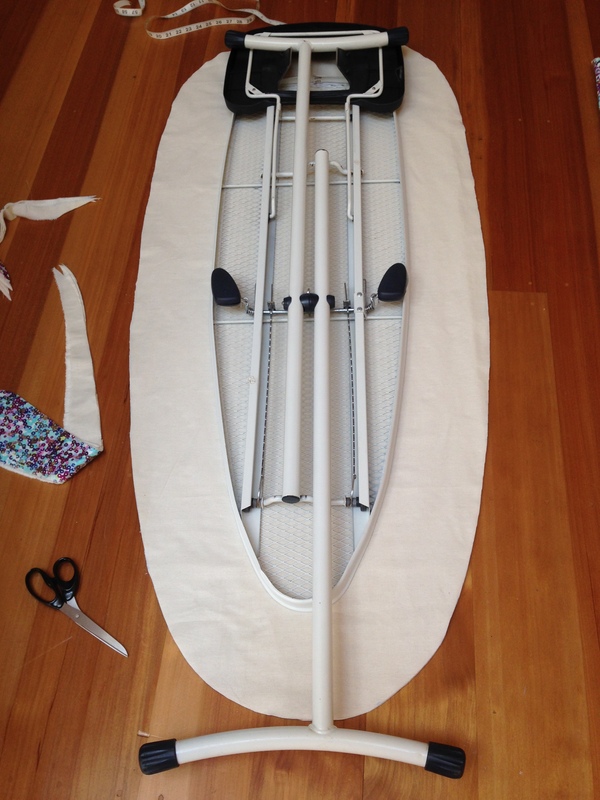 Measuring and cutting the ironing board cover. Fold the edge of the fabric over twice to make a 2.5cm casing. Pin the fold, then sew it AT LEAST 1.5cm from the folded edge of the fabric (otherwise your elastic won’t fit). Leave an opening of about 3cm at the end. Put a safety-pin in the end of the elastic to help you thread it through all the way around the edge of the ironing board cover. Once you’ve threaded the elastic all around the edge of the fabric, sew the two ends of the elastic together very securely. Then, sew up the 3cm opening you left in the previous step so the seam is complete. Open your ironing board. Put your old batting on the ironing board — it will provide extra padding. Put the two pieces of batting on the ironing board. Finally put your new cover on the board which should hold everything in place. Voila! 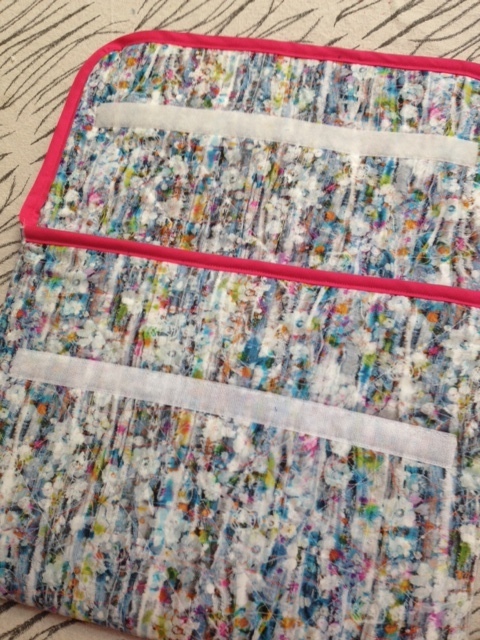 The finished ironing board cover with faux sequin fabric! All in all it’s a bit of work. You could save yourself the hassle and buy a cover from a large hardware chain for less than $20. But it wouldn’t look anywhere near as glamorous as this and anything to make ironing more fun has to be a good thing! I love sewing my own clothes. It means I can often wear something unique in colours that suit me (rather than what’s in the shops right now: usually black). Dress made with Liberty Japanese cotton and a Japanese pattern. Even if you have limited sewing ability or don’t have a sewing machine you should be able to make this dress. The pattern comes from the Japanese pattern book “I Am Cute Dresses” which you can probably buy at Books Kinokuniya or Tessuti in Sydney. In fact this dress is made from several different sized rectangles so all you have to do is cut out the rectangles and follow the instructions in the book which are very straight-forward (and yes they’re in English). The fabric I used for this dress is a Japanese-inspired city scene produced by Liberty of London. If you’re a more experienced sewer I recommend their fabrics because they are so comfortable to wear. Shaukat is the cheapest supplier I’ve found online, they sell Liberty prints for less than $20/metre. 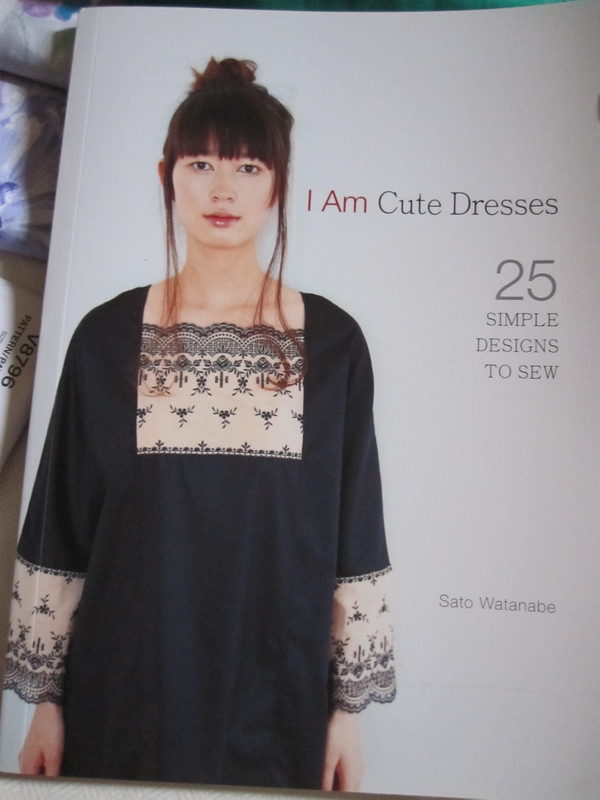 Have you ever sewn something from a Japanese pattern before? How did it go? This entry was posted in Sewing and tagged sewing. I recently made a doorstop for the bifold doors which lead out onto our back deck. The pattern comes from The Liberty Book of Home Sewing. The fabric is a laminated cotton purchased from Oil Cloth Addict on Etsy. 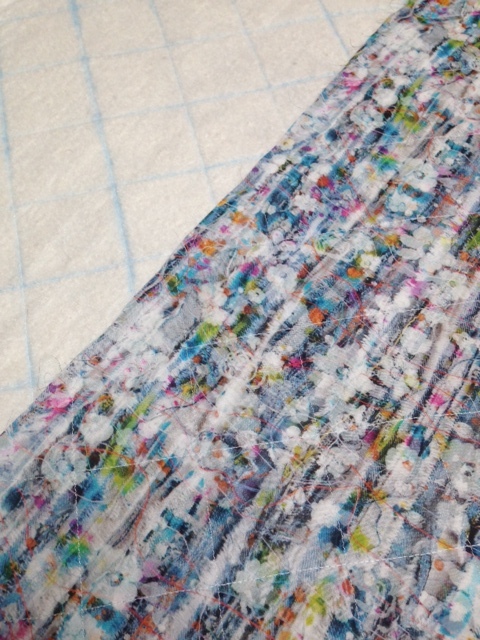 I hadn’t previously sewn with laminated cotton — I found it easiest to use when the laminated side was facing up on the sewing machine. The pattern suggests using corduroy but I thought laminated cotton was a better choice so the doorstop would be water resistant. I filled the doorstop with 2kg of “colourful sand” from the garden section of a hardware store, again a better choice for outdoor use than rice or sugar. This entry was posted in Sewing and tagged Liberty, sewing. I recently made some cushions out of this botanical fabric bought from Cloth in Surry Hills. Cloth screen prints their original designs on hemp or linen in rural NSW. They sell a few different botanical prints similar to this one in a variety of different colours. They have more designs in-store than on their website so it’s worth paying them a visit. They also sell ready-made cusions if you don’t have the sewing skillz, along with lamp shades, table mats, etc. This entry was posted in Sewing and tagged banksia, Cloth, fabric, sewing.